The Miracle Month of May is an opportunity to join forces with companies and individuals who are dedicated to raising funds and awareness for Rady Children's. It can be as simple as purchasing a paper Miracle Balloon from a business such as Costco, eating at a supporting restaurant or making a donation - the opportunities are endless! BUY a Miracle Balloon! BUY a Miracle Balloon or make a donation at the register! Visit any Costco, Rite Aid, Panda Express or a participating Credit Union and make a donation for a paper Miracle Balloon. SEND a Miracle Balloon, with words of encouragement, to one of our brave patients. GO to a fundraising event! Glance at the event calendar to find an event near you. SUPPORT businesses that support us! Learn about every day ways to help. START your own fundraiser! Create your own Miracle Makers fundraising page and invite all of your friends to support you. Or host an event at your house or business – size doesn't matter because every dollar makes a difference! Click here to learn more! HOST a Birthday fundraiser! Click here to learn more! 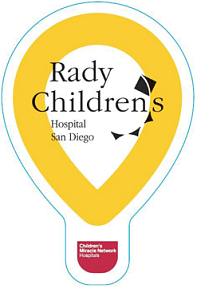 TWEET or post a message on FACEBOOK about Rady Children’s and ask your followers to donate online here. Title: Dr. Master Miss Mr. Mrs. Ms.